Heat oven to 375°F. Generously butter 8 regular muffin cups with softened butter. 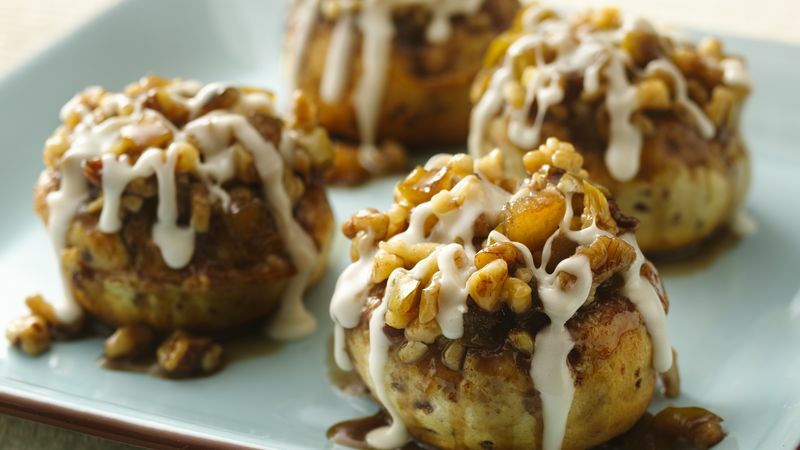 In bowl, mix apples, walnuts and brown sugar; divide evenly among muffin cups. Separate cinnamon rolls; reserve icing. Place 1 cinnamon roll in each cup. Bake 12 to 14 minutes or until tops are golden brown. Cool 5 minutes. Place cookie sheet upside down over muffin pan; turn over. Remove pan. Remove lid from icing; microwave on Medium (50%) 5 to 10 seconds or until thin enough to drizzle. Drizzle over warm buns. Serve warm.